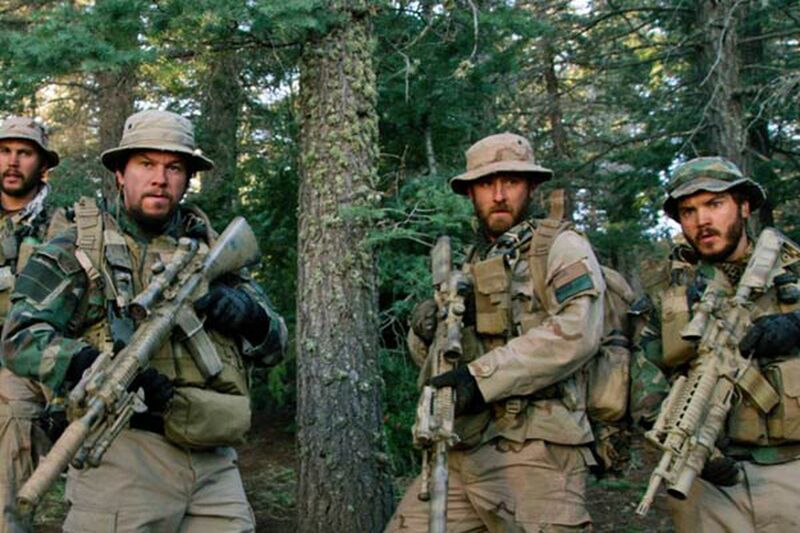 'This is feeling like a doomed op," Navy SEAL Matthew "Axe" Axelson (Ben Foster) mutters as he and his three brethren stand in a mountain clearing, ringed by rocks and trees, the radio not working, before things really start feeling doomed in Peter Berg's full-force combat movie Lone Survivor. Based on the book of the same name by Marcus Luttrell - his account of a botched mission to take out a Taliban leader in 2005 Afghanistan - this heart-pounding reenactment is unstinting in its depiction of the sudden shock and devastation of war. Four Americans, trained to believe they're invincible, run through the forest, taking cover on the jagged slopes as a swarm of Taliban with guns and grenade launchers box them in on the unforgiving terrain of Sawtalo Sar. Mark Wahlberg is Luttrell, a 29-year-old Texan with a girlfriend back home. Along with him and Axelson, the SEAL team members who find themselves outnumbered, outflanked, and out of luck are Lt. Michael Murphy (Taylor Kitsch) and Gunner's Mate Danny P. Dietz (Emile Hirsch). The four actors are committed and convincing, but their characters' backstories are almost incidental - we never know much about them, only that they have each other's back. A band of brothers. Lone Survivor's opening-title sequence offers a quick-cut montage of the hyper-rigorous training regimens these men go through. If they make the cut - most don't - they join the Special Forces elite, moving with stealth and lethal efficiency, seen winning the day in films such as Zero Dark Thirty and Captain Phillips. Lone Survivor, as its title suggests, does not offer a similarly triumphant outcome. Like Black Hawk Down, Ridley Scott's 2001 adaptation of the Mark Bowden book about a failed military operation in Somalia, Berg's movie is a story of fraternity and courage - and crossed signals, technical bungles, and strategic blunders. The middle 40 minutes of Lone Survivor have to be some of the toughest battle scenes in Hollywood history - an epic, close-range firefight that finds the SEALs throwing themselves down rock faces like superheroes. Only they aren't superheroes - they bleed, they break. This is not a film that pretends to investigate the deeper meanings of war, or to analyze geopolitical or cultural issues. A moral choice faced by the SEALs early on is pivotal to the story and resonates in the film's third act, but mostly Lone Survivor is a step-by-fateful-step study of human endurance, of desperation, of resolve, and resignation. Directed by Peter Berg. With Mark Wahlberg, Taylor Kitsch, Emile Hirsch, and Ben Foster. Distributed by Universal Pictures.